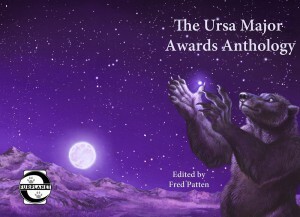 As Furry Fandom’s Ursa Major Awards enter their 10th year, Fred Patten (a long-time member of the Awards’ parent organization, the Anthropomorphic Literature and Arts Association) has collected and edited some of the best winners and nominees from the Awards’ “Short Fiction” category into a new book, the Ursa Major Awards Anthology. It’s coming at the end of June from Fur Planet Productions. Featuring short stories by Brock Hoagland, Michael H. Payne, M.C.A. Hogarth, Chas P.A. Melville, Kristin Fontaine, Kyell Gold, Jim Hayden, Samuel C. Conway, Paul Di Filippo, and Naomi Kritzer, as well as original illustrations, the anthology also features a new wrap-around cover by Blotch. Sample copies of the anthology were available at Anthrocon — and sold briskly. You can find out more at Fur Planet Productions’ pre-order page.